← Settled science part 1: Is science ever actually settled? In the previous post, I explained what we mean by “settled science” and why there often aren’t two legitimate sides to a story. Nevertheless, despite a massive scientific consensus on issues like climate change, there is still widespread disagreement among the general public. A fascinating recent survey showed just how massive the disconnect between the public and scientists is. For example, it found that 88% of surveyed scientists thought that GMOs were safe to eat, but only 37% of the general public agreed! Similarly, 87% of surveyed scientists thought that man-made climate change was real, whereas only 50% of the public agreed. Human evolution was similarly divided, with 98% of scientists agreeing compared to only 65% of the general public (note: the survey was conduced across all AAAS scientists, and all of those numbers are higher when you just look at the experts within the given field). So why does this disconnect exist? The answer is a combination of deceptive tactics by the anti-science movement and disproportionate coverage by the media (as well as an unhealthy dose of personal bias). So in this post, I want to examine the ways that people create the illusion of a debate. One common tactic is to downplay the level of certainty that scientists have. There is no better example of this than the well-worn creationist claim that evolution is, “just a theory.” In reality, a theory is among the highest forms of scientific certainty. A theory is an explanatory framework that has been repeatedly and rigorously tested and has a high predictive power (in other words, it consistently predicts the outcomes of experiments and it explains facts). So when we say that evolution is a theory, we are actually acknowledging that we are extremely certain about it, but this deceptive argument tries to make it appear that we aren’t very certain by tapping into the popular (and erroneous) concept that a theory is just an educated guess. Another way that people try to diminish the certainty is by claiming (or implying) that since science can’t actually prove anything, it isn’t reliable and there is reasonable doubt (this has long been one of the cornerstones of the intelligent design movement). Not being able to prove something with 100% certainty and having reasonable doubt are, however, two very different things. 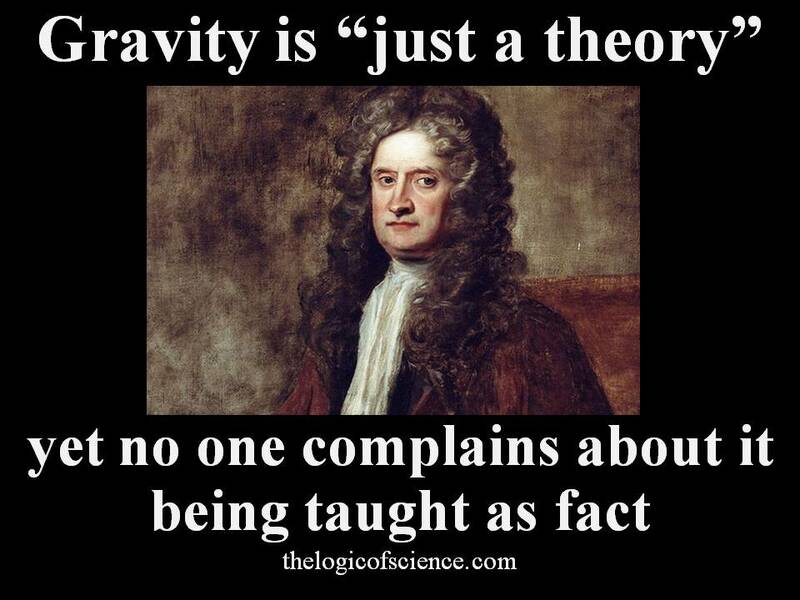 We have not proved gravity, cell theory, germ theory, atomic theory, etc., but having doubt on any of those topics would be completely unreasonable. Finally people often simply defer to the argument that, “scientists have been wrong in the past.” I have debunked this one before, so I want waste time one it here. Science is complicated, and for most things that qualify as “settled science,” the core concepts are widely agreed upon, but the details are debated. Anti-scientists love to hop on these disagreements about details and conflate them into core disagreements. For example, creationists like to present disagreements about certain dates or certain evolutionary histories as evidence that scientists don’t agree about evolution, but the reality is that we agree about the core concept that all life on planet earth evolved from a single cell, we just disagree about some of the details about exactly when and how certain evolutionary changes took place. So quibbles over which fossils represent the ancestor to whales, or whether a rock is 65 million years old or 70 million years old are completely irrelevant to whether or not evolution itself is actually true and widely agreed upon. Similarly, climate change deniers like to claim that the models have all been wrong, and they cite this as evidence that scientists don’t really know what they are doing, but the reality is that most of the models have been very accurate. Some of the details have been a bit off (which is to be expected for any model), but the core concepts (increasing temperatures, increasing sea level, etc.) have all consistently come true (Marotzke and Forster 2015). All anti-science positions have a host of “experts” that they frequently cite as evidence that their position is correct or, at the very least, that there is debate about the issue. More often than not, however, their experts aren’t actually credentialed in the relevant fields. The anti-vaccine movement is particularly full of examples of this. Take Jenny McCarthy, for example. Anti-vaccers follow here religiously, but she is just a celebrity, she has no scientific credentials. Further, even most of their actual doctors and scientists have no credentials or experience with vaccines, immunology, or any other relevant field. For example, Dr. Sherri Tenpenny is often cited as an expert who opposes vaccines, but she is an osteopath, which has nothing whatsoever to do with vaccines (see this video for a hilarious example of her ignorance). Becoming a doctor doesn’t automatically endow you with knowledge about all aspects of medicine. Both medicine and science are extremely complicated, and most scientists don’t know a tremendous amount about areas outside of their own research. So, when you are trying to figure out whether or not there is a real debate about an issue, make sure that you are looking for a debate among experts. If the only ones who disagree with the mainstream view are people who have no experience or credentials in the relevant fields, then its safe to conclude that there isn’t a real debate. Every once in a while, the anti-science movement will dig up someone who agrees with them and actually has credentials in a relevant field, but, as I explained in the previous post, that is still not enough to actually demonstrate that there is a significant debate on an issue. There will always be a few dissenting voices no matter how certain we are of something. Nevertheless, the anti-science movement loves to present what are truly a handful of experts as if they were an overwhelming throng of scientists abandoning the mainstream view like rats abandoning a sinking ship. This strategy jumps from simply citing “experts” to getting a bunch of them to actually sign a petition. There are several reasons why this is problematic. First, science isn’t a democracy. In science, you prove your point with evidence, not petitions. Further, the signatories of these petitions often have no credentials in the relevant fields, and even when they do, they invariably represent only a very tiny portion of people working in that field. Probably the most famous example of this is the “Oregon Petition” which claims to have the signatures of 31,000 scientists who disagree with anthropocentric climate change. This petition was debunked more thoroughly here, but in short, only a small portion of the signatories were actually scientists, and only a handful of them were climatologists. So this petition did not in anyway shape or form succeed at establishing the notion that there is a significant scientific debate about climate change, and you cannot use it as evidence of such. This is one of the most obvious ploys, and the media is largely responsible for it. They present two people (one for a position and one against it) and two sides. This false balance creates the illusion that both sides have equal (or least good) merit and should be taken seriously. It makes it appear that there is a strong disagreement among scientists even when one position is actually only held by an extremely small minority of researchers. As Jon Oliver hilariously explains, a truly representative debate on climate change, for example, would be three deniers vs. 97 scientists. Further, in these debates, the anti-science position is often represented by someone who is not actually an expert on the topic at hand. This is another fault of the media that is closely related to public debate problem. The media, in their obsession to cover “both sides” of every story, gives equal time to the scientific position and the anti-science position even though one of them is demonstrably false. For example, it is not uncommon to see stories that start with something like, “experts are blaming the current disease outbreak on low vaccination rates…” then shift to, “but not everyone is convinced [insert interviews with people who aren’t convinced].” Who cares if some people aren’t convinced? The science on this is extremely clear, and anyone who thinks that low vaccination rates don’t cause disease outbreaks is simply wrong. There is utterly no reason to give time to a position that is factually incorrect. To be clear, I’m not trying to “suppress peoples’ opinions,” because I am talking about facts, not opinions. Let me try to give a silly example to illustrate what I am saying here. Imagine a news story about the shape of the earth that goes something like this, “Scientists have refined their estimate of the earth’s diameter by an addition two meters, but not everyone is convinced. We talked to several people who argue that the earth is actually flat (insert interviews with flat-earthers).” That story would obviously be absurd. The flat-earthers wouldn’t deserve equal time (or any time) because they are clearly wrong. Even so, when news stories devote time to people who think vaccines don’t work, climate change isn’t real, the earth is 10,000 years old, etc. it is deceptive because those people are simply wrong. You’re welcome to believe something that is factually incorrect (like the earth is flat), but the rest of us aren’t obligated to listen to you, take you seriously, or give you equal time. There is really only one criteria that matters for determining whether or not there is significant scientific debate about an issue, and that criteria is the peer-reviewed literature. If there is significant debate, you will find it there. Media debates, Youtube videos, petitions, personal opinions, etc. are all irrelevant and frequently fabricate conflicts where none exist. 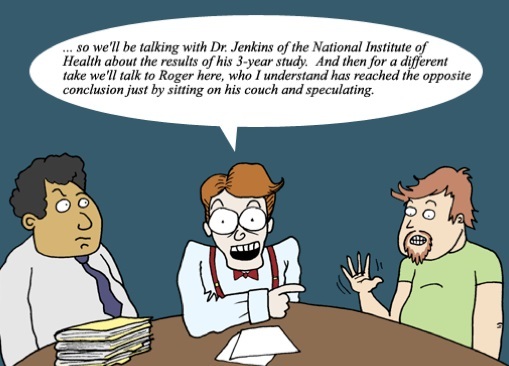 If the recent peer-reviewed literature contains numerous high quality papers on both sides of an issue, all of which present new data and are carefully testing the predictions of both sides, then there is a debate, but, when the literature is dominated by one position while the other is represented by only a handful of low quality papers, then there isn’t a debate, and you have to accept the fact that your position flies in the face of a strong scientific consensus (or better yet, re-examine in the evidence and see if just maybe you are on the wrong side of history). This entry was posted in Nature of Science and tagged appeal to authority fallacies, Bad arguments, creationism, evolution, global climate change, Vaccines. Bookmark the permalink. “One common tactic is to downplay the level of certainty that scientists have. ” Every physical measurement in the world has error associated. Error is the same as uncertainty. Models, by definition have a lot of uncertainty built in because we can’t do experiments with the actual system, so we try to use models to take the place of the actual system. That’s why calculating the uncertainty is critical. In the case of the General Circulation Models, the forecasts over 10 to 20 years of temperatures are simply out of bounds. Of course, every time the IPCC publishes new numbers, they update the model outputs to show better accuracy, but this is over a short period. Models are not perfect, but they are useful tools in many cases. In the climate sense they have never been correct in predicting temperatures, and thus they have failed. It is time to take a close look at these multi-million dollar toys and make some decisions on whether they are worth using for trillion dollar social policies. “Another way that people try to diminish the certainty is by claiming (or implying) that since science can’t actually prove anything,” You seem to have a basic misunderstanding of the scientific method. The object is to fabricate a theory, state a falsifiable hypothesis, and then run your experiment collecting data, analyze the data, and then test the data. If the null hypothesis is falsified then you might be on to something. Just proving one case does not prove the theory. You must be able to falsify the null hypothesis, and even then you can still be wrong. Nothing is sacred. You can “prove” you theory a million times, and then you might feel secure, but one event can falsify the whole thing. It’s a tough world out there. Check Albert Einstein’s thoughts on the matter. It seems that your entire article is predicated on talking points that assume that people don’t think global warming is real. Most people agree that it is real. You see, global warming, or most scientific endeavors, is not a black or white thing. There are always degrees of difference. I have read a number of your blogs, now, and am impressed that you can write well, and have something to say. However, I think you have some incorrect ideas. You say that the peer review process is the only way for scientific debate. I don’t believe that, and I don’t think you do, either. Remember the early days of the DARPA Internet where academic mail lists and bulletin boards were major vehicles for scientific debate? Correspondence of all types have always played host to serious scientific debate. We all respect peer review, but it is limited, and has become a choke point in scientific debate. Blogs are becoming debate vehicles of importance, but they are not peer reviewed. I am not sure how to accredit blogs, but maybe the market will make that decision. A good example is Watts Up With That by Anthony Watts. I don’t agree with everything Anthony publishes, but he does publish a lot of pro/con stuff on climate science. He moderation policies encourage a diversity of commenters. His hit rates are phenomenal. Another very popular science blog is Dr Judith Curry’s blog, Climate, Etc. Her posts regularly get hundreds of comments, and she is very easy on moderation, too. People can debate to their heart’s content. The debates on Curry’s blog are very interesting. One of the problems with peer reviewed literature is that so much of it is simply bad science. For example, Lancet published the well known paper that linked autism to vaccinations, and there ensued a panic across the world that has cost lives. Peer review did not work for Michael Mann’s much debunked hockey stick papers, either. All it took was for one curious blogging engineer to bring that house of cards down. My proposal is that blogs are a good place for academic review and debate, and should be used. At least one hockey stick like paper was removed from consideration of publication because of egregious errors found by bloggers. Blogs have value, and that value will increase as time goes on. You write a good blog, I just don’t happen to agree with you all the time. The problem with blogs, which is the fundamental problem that I am trying to deal with in these two posts, is that they don’t necessarily reflect an actual scientific debate. In other words, the fact that a blogger presents a “debate” doesn’t mean that a debate actually exists, that’s my point. A debate among the general public and a debate among scientists are often two very different things. Mailing lists and similar venues are certainly useful for discussions among scientists, but significant debates always find their way into the literature. In other words, if there is actually serious disagreement on an issue (and, importantly, f there are data that fuel the disagreement), it won’t be contained by a mailing list. For example, you mentioned Wakefield’s study linking vaccines and autism. That paper was found to be erroneous because numerous peer-reviewed papers disagreed with it (that’s what spawned the investigation). In other words, the debate on the issue was represented in the literature (though now a consensus has been reached and the debate no longer exists). Similarly, Mann’s hokey stick model was debated via multiple peer-reviewed papers (on a side note, although some of the details of his model were off, his general conclusions and the overall fit of the model have been confirmed numerous times, so he was actually right more than wrong. sources here http://www.skepticalscience.com/broken-hockey-stick.htm). So yes, the peer-review system is imperfect. I have talked about that numerous times on this blog, but the good thing about it is that it is self correcting. Both of the examples above demonstrate that beautifully. Fallacy_Man: Oh, come on. Surely you cannot think that Mann’s presentation which eliminates the entire, well documented Medieval Warm Period, and the equally prominent Little Ice Age is in any way accurate. That is simply a disregard of science. First of all, Mann used inappropriate tree ring data, and then truncated the data at 1940 because it did not show his predetermined conclusion. Secondly, Mann juiced his algorithms by off-centering his PCA’s. This has been documented many times, and subsequent hockey sticks are just attempts to salvage a crumbling carrier of a debunked scientist. Other hockey sticks were done by co-authors, of used the same data, or even the same routines. They are not independent of the original hockey stick sin. To make matters worse, in one he even inverted data (Tiljander varves) to achieve his stick. Nobody thinks Mann does science anymore, especially since the Penn State cover up of his investigation. Entire books have been written about Mann and his scientific peccadillos. You need to check them out. Incidentally, Karoly and Gergis had to withdraw their Australian hockey stick because their awkward data manipulations were caught by the blogging community. I say there is value in blogs like yours because discussions can happen immediately, and do not depend on peer review that amounts to buddy review as Mann’s reviewers were. It’s a done deal. Mann’s stuff is dead. You should also check out the links to the other lines of evidence in the Skeptical Science link I posted. Entire books have been written about aliens at Roswell, but that doesn’t mean the information in them is reliable. I never said that blogs don’t have value. They can be quite useful for explaining concepts and critiquing science (if I didn’t think that, I wouldn’t be spending all my free time writing this one), but my point is that they can’t be construed as representing a significant scientific debate. It doesn’t matter how many bloggers say that there is disagreement on whether or not humans are significantly altering the climate because there is almost no disagreement in the actual published literature. That holds true even if bloggers sometimes find problems with published papers. For example, I recently wrote a post in which I was very critical about several anti-GMO papers, and I pointed out multiple methodological flaws in those papers. Let’s say for sake of example that there was a strong scientific consensus that GMOs are dangerous (in reality the opposite is true). If that was the case, then the fact that I found flaws in published papers would not mean that all anti-GMO papers were bad, and it most definitely wouldn’t mean that there was significant debate on the issue. All it would mean was that those particular papers were flawed. Care to explain your blatant hypocrisy? Which is it? Are “BLOGS” useful or not? Re-Analysis? Do you really understand what you are saying? Re-analysis? That means that you have diddled the data. You don’t change the data just to publish another paper. The follow-up sticks of Mann’s have not been independent, either having been done by co-authors of Mann, members of his social network, or using the same data and methods. Same bad science. The Graybill bristlecone pines the formed the basis for the stick’s shape were specifically not recommended as temperature proxies, and most of the Mann related sticks blatantly use this inappropriate data. Secondly, it seems stylish for people like Mann, Brifa, and Jones to truncate their proxy data when it starts looking bad. You are aware of the divergence problems within dendrochronology? This juxtified against dozens of papers supporting the Midieval Warm Period and the Little Ice Age. The MWP was actually warmer than the current warm period as supported by eclectic evidence: academic papers; archaeological evidence; and historical data. There are very few papers, like Mann’s, claiming otherwise. This is one of those cases where even the most staunch supporter of CAGW will not come to Mann’s support as evidenced in the Climate Papers. The guy may be brilliant, but he has done some really shoddy work. Certainly you can see this. Why do you keep trying to use Skeptical Science as some sort of reputable source? You know that it is run by John Cook and is not a place to go for accurate information. Have you actually read the paper I linked to? Because when they re-analyzed the data (and yes, re-analysis is the appropriate term), they did things like using methods other than the bristle-cones. Indeed, they tried multiple permutations of the data to account for the criticism that you are presenting and they all gave the same result: the hokey stick shape holds. Further, the scientific community is surprisingly small, so eliminating people who aren’t in Mann’s “social network” would essentially eliminate all climatologists, so that criticism hardly seems fair. In that last post, I definitely cited a peer-reviewed paper, not Skeptical Science. Red herring. You know better than to throw out nonsense analogies. The books I am referring to are sourced very well. Instead of criticising, maybe you can do some much needed research. Try the Hockey Stick Illusion by AW Monfort. I endorse his book because I was an observer of the events as they unfolded. As a matter of fact, Michael Mann’s performance in front of the Senate Committee is what caused me to start looking at global warming. Mann is the architect of his own problems. Fallacy_Man: I did go to Skeptical Science for one of your references, and was amused to see that you were blindly referencing a paper by Wahl and Amman (2005). The reputation of this particular paper has gained a certain level of stomach acid in climate science. It is a poor attempt at science, and its trip from Genesis (pun) to publishing is called the story of the Jesus Paper. You really need to determine the quality of your references. Jesus Paper? Hilarious! Even the Jesus Paper can’t save Mann’s work. Forgive the blasphemy. Wait a minute, you berate me to no end for citing Skeptical Science, yet your source is Bishop Hill? Biship Hill is frequently inaccurate, and Montford has even less scientific credentials than Cook does (and you seem to be pretty big on focusing on people’s credentials). BTW, its not at all uncommon for a paper to be archived before it is officially published. I was going to write more, but I’m really tired, so can we please agree to be done? I don’t really see this debate going anywhere productive and it is taking up way too much of my time. Well, you apparently have no sense of humor. I just threw Bishop Hill in BECAUSE he is not a terribly technical person, and because it doesn’t take a technical person to see the glaring faults in the Jesus Paper. The reason it was called the Jesus Paper is because it was rejected several times, and was resurrected several times to support a meme that was false in its inception. You see, the Jesus Paper was guilty of one of the same problems that plagued Mann and his early sticks. Amman and Wahl could not seem to calibrate their tree ring data against a temperature standard. Their R-Squared was non-existent, and that meant that their data was garbage if used as a temperature proxy. Don’t you get it? Don’t you see the humor in the situation? To this day, Michael Mann has refused to publish the R-Squared from his early efforts. The whole hockey stick thing is a joke, and the world is realizing it. All you are doing is recycling some lame talking points. You do have a nice echo chamber, here, and it’s nice to know that some people like the strangely named fallacy_man cannot be confused with facts. Their minds are made up. Well, that could be said about many on both sides, don’t you think? But there’s always hope. I, for instance, am one of those whose mind was “made up” about AGW for many years, and then switched “sides” (not in favor of yours, though). Ah,Miguel, Miguel, Miguel. First you say you do, and then you don’t. Most intelligent people change in the other direction. Oh, how elegant the greenhouse stuff sounds until you look at the data and science. Of course, AGW exists but there is no science that says that any catastrophes will result as the result of climate change. If there is I am sure you could fine some empirical data to support that viewpoint. There isn’t any. One of the things that makes this blog an anti-science refuge is the blind reference of wounded-duck references, such as fallacy-man’s unhesitating use of John Cook’s discredited consensus-hoax paper. If you guys don’t question the data behind the unthinking talking points of pseudo-scientists, you are doomed to eternal damnation. Or, something like that. It’s not cool to quote ignorant, non-scientists like Cook. Despite all your ramblings, you still haven’t provided a single good reason think that the data in Cook et al. isn’t reliable. Further, for all of your talk of actually looking at the data, you are the one who made multiple posts (in caps lock) about Cook et al. “throwing out all but 200 of their papers” before you finally admitted that you were pulling that number out of thin air. So you have pretty weak grounds for accusing me of not questioning the data. I’m really content not to go into this again (though somehow I have a feeling that I’ve just screwed that possibility), but if you want to go one more round, here is my question for you: exactly which part of Cook’s methodology do you disagree with? Tell me the exact paragraph where you think he did something inappropriate. I’m not interested in your vague claims about throwing out data, or numbers that you made up, I want to see exactly where you think he messed up. “First you say you do, and then you don’t”. “Most intelligent people change in the other direction”. My initial opinion from about fifteen years back was based -like, I suppose, most people’s- in what I watched, heard, and read on mass media and the first internet. As such it was much more backed by others opinion that hard data. In time I got worried by that and started researching the scientific literature on my own. I can tell you, it was hard, it was slow, and it was painful. I even unearthed the statistic books from my college days and used them as night reading for a while, until I was confident enough that I could make head or tails of the numbers in all those papers. That is way I resent the mildly -and not that mildly- insulting stance of so many from both sides who cannot refrain from expressing how stupid they think everyone who does not believe what they believe is. You know, no one ever convinced anyone else by insulting them. On the other hand, it can make you feel better, but that is not the issue, or is it?